The Lake George area in Colorado is well known for it's amazing Amazonite and topaz specimens, but most people don't realize that there are some superb gem quality Smoky Quartz crystals found there as well. This gem ordinarily wouldn't be very significant were it not from one of the most historic and classic localities in Colorado. 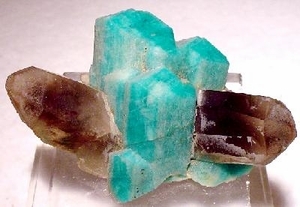 Amazonite is a variety of microcline colored blue or green by trace amounts of lead. These Colorado specimens are highly sought after by mineral collectors.